My boyfriends mother bought us a can of Pam to bring camping this coming weekend. I kind of looked in horror when I saw this item come out of the grocery bag, but it makes me laugh now reading your post. 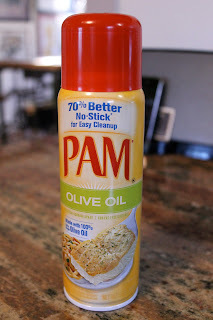 There is a Pam specifically for grilling!! I'm not sure how I feel about it either, I don't think I am ready to use it. Okay, good. I feel better that my prejudice of Pam isn't so off base...although now that I've been using, I am a little afraid I'm getting addicted.